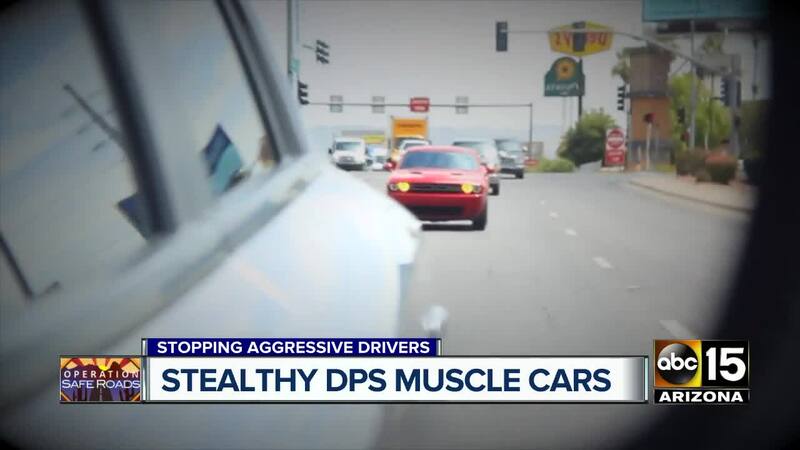 The Arizona Department of Public Safety is using stealthy "muscle" cars to crack down on unsuspecting aggressive drivers. They don't look like police cars until the lights go on. Then the pedal goes down. Trooper Jason Seeger drives one of the unmarked "muscle cars" in the Arizona Department of Public Safety fleet. His is a silver Dodge Charger. The uniformed trooper is essentially invisible to other drivers. Every day he stops between 10 to 15 aggressive drivers, unless it's a day with no rush hour. "I can get between 15 and 20 people without even breaking a sweat," he said. They're the speeders, the tailgaters, the wild lane changers. But "getting them" isn't the goal, he said, as much as slowing them down is. "Most troopers don't have the mindset to wake up in the morning and just target people who are speeding," Trooper Seeger said. "Most troopers have the mindset to slow people down." What do they say when they realize he's a trooper? "They usually sigh really big and say, 'I had no idea,'" he said. The director of the Governor's Office of Highway Safety said since 2016, the agency has provided funding for about a dozen of these cars. They never sit and run radar. They're always moving, always watching. Part of the goal is to stop road rage before it happens. Some critics question the need for muscle car speed, wondering if it's more flash than what's necessary. "These vehicles have a specific purpose, and that's to target drivers that are a danger to all of us," said DPS spokesperson Trooper Kameron Lee. "Why wouldn't we all want to be safer on the roadway, our main purpose in traffic enforcement." As for showing these cars on television and blowing their cover? Trooper Seeger said that informing the public that DPS could be in something besides a traditional police car is part of the idea. Drivers should be aware that they don't know if they're being watched, so they need to watch their speed and manners on the road.